It’s summer. The kids are playing in the yard and it’s a day to enjoy being outdoors. It is finely time to look after one of the renovation projects around the home or garage. One of the maintenance projects is to get rid of the unsightly stains on the garage floor while the children seem to be getting along and entertaining themselves. Here are some tips to make this unglamorous task simpler and more straightforward. One of the easiest ways to clear small debris from the garage is to use the leaf blower. As long as this is being done regularly, the leaf blower is a great way to clear dust and debris to the outside. If there’s too much dust around, the leaf blower may not be the best option. The leaf blower works particularly well if you have a polyaspartic garage floor or floor tiles including the Ribtrax type tiles. The debris should be blown from rear to front. With the Ribtrax, it’s the same. With many channels below the tiles, debris and dust will flow forward and out the front edge when the leaf blower is used. When bare cement is exposed or the garage floor has not been cleared of dust and debris regularly, there may be a lot of unwanted cement dust and general debris flying through the air. A lot of the dust will end up on bikes, toys and other storage items. A better alternative would be to use the shop vac or a dust broom and pan. The leaf blower makes the job easy and quick. There’s no need to move heavy objects out of the way because the blower will dislodge hidden dirt, dust and small objects from behind large items in the garage. Use a lower setting to start on the leaf blower. Take some precautions when using the leaf blower. Use a dust mask to protect your lungs. Leaf blowers are powerful enough to lift small debris such as nuts, washers and nails. It can also lift and peel loose areas of a painted garage floor. All of these objects can become painful projectiles. Move vehicles safely out of the way and assure your family is safely spending time elsewhere in the yard or house. If you have a polyaspartic coated garage floor, oil spilled won’t soak into the polyaspartic floor. Instead, it will sit on top of the floor coating. While polyaspartic floor coatings are highly chemical resistant, look after the floor by cleaning up spills immediately. Remove oil spills soon after they happen to prevent it from being spread all over the garage or dragged into the house by younger family members walking through the garage. To clean an oil stain, start by using an absorbent material to soak up the oil. Some good absorbent materials include cat litter, saw dust, baking powder and diatomaceous earth. Cover the entire oil stain completely and leave it there for 24 hours so the oil has a chance to absorb fully. Once the oil is absorbed into one of these materials, it’s easy to scoop up the absorbent material along with the oil soaked into it. Dispose of them safely at a drop off depot for household hazardous waste. Finally, a little dish soap and hot water to wash the area where the oil was sitting will eliminate any remaining film. Dry the area with disposable paper towels and your polyaspartic garage floor should be back to its original condition. With garage floor tiles, you can just replace specific tiles or use a similar process to clean the tile. The quality of the cleaning results will depend on the floor tile. The Ribtrax floor tiles will allow you to remove a single tile or multiple tiles to clean a stain in the concrete floor below. If you have exposed concrete where the oil spill occurred, start with the steps above. When using the soap with water, leave it in place for up to an hour. Then, use an absorbent material to soak up the soapy spot and oil mixture. A paste can also be made from the soap and water mixture plus absorbent material. Leave the paste in place until dry. Always remove and dispose of the paste at a drop-off depot. If the stain is older or deep, you may have to repeat this process a few times to draw out all of the oil from the concrete. There are also a variety of non-toxic commercial cleaners such as Simply Green or Oil Eaters which people have found to provide success. Check manufacturer’s instructions for applicable surfaces and steps to using these products. Polyaspartic floors are the easiest to clean. 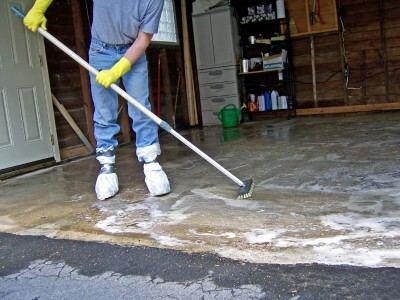 A general cleaning of the surface of the typical polyaspartic garage floor is easy to do with a string mop and a bucket of water with any of a wide variety of floor cleaning products such as vinegar, a couple of drops of dish soap, a wide variety of green cleaners and non-toxic commercial cleaners. This can also be done with garage floor tiles as well. You can also wipe dry any remaining water so the cleaning can be done most months of the year. With a concrete floor, you may need a long handled scrub brush to remove and lift other types of stains along with a stronger soapy mixture. Finally, hose down the garage floor with garden hose. And, you’ll want to make sure you do this on a warm day to give the cement time to dry. In the GTA, this means cement floors need to be cleaned in the few summer months available. The main advantage of the Ribtrax floor tile is that the tile surface is easy to clean with a degreaser spray and a mopping of the surface. Maintain the tile surface regularly so kids and other family members are not dragging all sorts of oils and chemicals into the house. When weather permits, remove the debris and dust below to keep the entire system clean. To maintain your garage floor more easily, look after oil stains soon after they occur for improved success and thorough stain removal. It will make general cleaning of the floor easier. Of course, the concrete floor is the most difficult part of the floor to clean and maintain. It is also more difficult to remove oil stains from concrete than some of these other materials. To reduce the maintenance work, consider garage floor tiles or polyaspartic floor coatings to keep the cleaning task easy and free from concrete dust. If you’re interested in renovating your garage this summer, the garage floor is a great project to consider. If you’re looking to upgrade your garage floor, contact our garage renovation specialists for a complimentary in-home consultation today.